Once you’ve perfected your strokes and learned all of the strategies and tactics in “The Previdi System,” you probably think you are now a great tennis player and will win all of your matches. That mind set, however, is what causes so many players to never be better than average with average results. 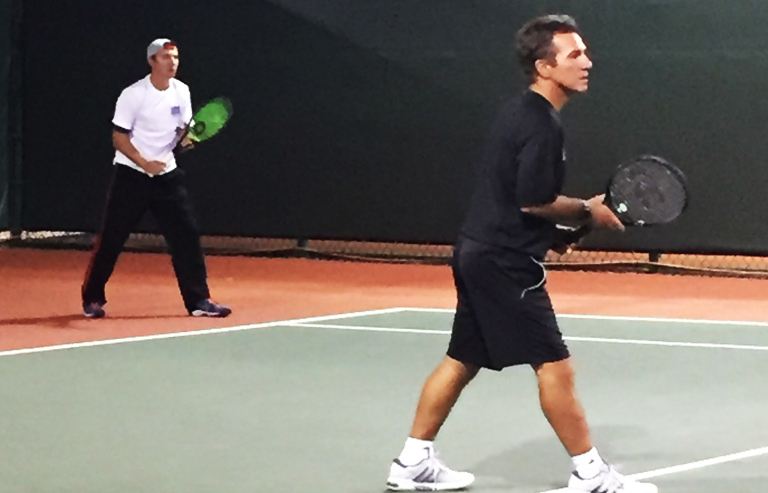 The qualities you need to be a great doubles player, and a great tennis player are intangible. One of the reasons so many players can’t figure out why they don’t have better results is because they are only looking at what they can see with their eyes; strokes, power, athleticism, etc. When they look at these things in others and compare them to themselves they can’t understand how they’re losing and why other , less talented players ( in their opinion) have such good results and they don’t. We’re going to answer that question here and hopefully give everyone that last ingredient they need to be successful and fulfilled in their tennis game. The two qualities I’m talking about are mental qualities. Bob Knight, the legendary basketball coach used to say that in sports, mental to physical is 4 to 1. What he meant is that developing the mental qualities it takes to be successful in basketball, or in our case, tennis, are four times more important than the physical qualities. Think about it this way. If you aren’t committed to working hard to get better, then you’ll never have great strokes. If you’re not willing to be disciplined enough and mentally tough enough to train harder than everyone you play, you’ll never be in great shape. Everything you do physically is controlled by your thoughts. Your commitment, your ability to remain calm regardless of the situation, these are mental aspects of the game and you need a strong mental constitution to reach your full potential. The first quality you must have is acceptance. You must be willing to accept everything that is going on on the court and adapt to every situation that comes up, whether it’s about you, your opponent or the conditions you’re playing under. You won’t play great every day, you won’t always win when you play well,your partner may play poorly, you might get some bad line calls, the wind might play havoc with your serve and lobs,and the list goes on and on. The average player, at any level, has little or no ability to accept these things and focus on the situation they’re in, while they’re in it. They complain, get tense, let unnecessary thoughts get into their head and the result is a poorly played match, probably a loss, where they don’t learn anything! When you walk on the court you already know what you’re supposed to do. Make a lot of returns, get your first serve in,deep-to-deep, short-to-short, communicate with your partner, etc. Those are the things you’re to focus on and accept whatever variables come up during the match because they are limitless and whoever handles them better is a better player. Accept the fact that different parts of your game work to varying degrees every day. Accept the fact that your partner may not be able to put a ball in the ocean. Accept the fact that your opponents hit a lot of lobs and soft balls. Whatever IT is, accept it and move on. Don’t try to talk yourself into being confident and staying positive. It sounds like a good idea but the problem for most players is that they are only confident when they’re playing well, so the minute things get tough their confidence is gone. The problem with positive thoughts and positive words is that you’re only using them because you’re afraid of the negative. Embrace, accept and let go of all thoughts that can’t help you. “Trying” to be confident or stay positive is a bad idea because, once again, you’re trying. You can’t play instinctive, natural tennis while you’re trying. The thing to do is relax, breathe and move on immediately once a point is over. Which leads us into the second quality you must have to be a great player. The second quality you must have to be a great player is the ability to stay present at all times. Our coach used to ask us what the most important point in a match is. People would guess the first point, the last point, set point, match point, etc. Once we were all exhausted from thinking and guessing wrong he would give us the answer. The most important point in the match is the one you’re playing right now because it’s the only one you can ever win. You can’t change the points you’ve already played but continuing to think about them will definitely hurt you in the present. If you dwell on your mistakes you will be more likely to keep making mistakes which leads to playing poorly overall. There is no reason that a bad shot should lead to another bad shot unless we can’t get the thought of the previous shot out of our mind. The rule I always tell my students is “never let a bad shot cost you more than one point.” By the same token, projecting forward in a match is equally dangerous. If you’re down 4-0, the only thing you can do is win the next point. You can’t catch up all at once. Your opponents won four games, one point at a time but you can’t win it all back at once. You need to talk to your partner and remind them that you need to focus on the next point. You can’t win points that haven’t been played yet but getting distracted by them will take your focus off the task at hand. The other problem with thinking ahead is when you start to think about the final result during the match. you let your mind wander to what other people think or are going to think of our game ( everyone does this to some extent), how this match will affect your rating or ranking, what you’re doing wrong on a specific shot, etc. These or any other thoughts that don’t keep you focused on the task at hand are a recipe for disaster. They take your mind off the present, make you tense and nervous and can only help you to play worse and be more frustrated. The anxiety you’re creating will be felt by your partner as well and will affect their ability to play well too. Here are some tips for developing acceptance and learning to stay present. 1.) When a point ends and either you or your partner is ready to dwell or make a negative comment on what just happened, say “next point” and move on. Unless your conversation is strategic ( I’m coming in on my return of serve), supportive ( don’t worry, you’ll get the next one), or observational (they’re having trouble returning your serve with their backhand, let’s go there again), there’s nothing more to say. Move on and play the next point. 2.) Understand that every match is different and can pose a completely new set of challenges. Every match you play will be different. Too many players are trying to live up to some ideal way that they play ( which is imaginary) which is an amalgam of every good thing they’ve ever done on a tennis court. This is how they think they’re supposed to play and when they don’t live up to this ideal they get tense and upset and their game goes downhill. Understand that every match is going to pose different challenges and that if we stay true to our basic principles ( be consistent and play together using good positioning and shot selection), we can make the necessary adjustments and put ourselves in a position to be successful. Recently my partner and I played against one of the top 50 and over teams in the country and the #1 team in New England. We had lost a close match to them (7-6 in the third) two months earlier. This time we ran out to a 5-0 lead in the first set. Everything we did was gold, every shot we hit was perfect. We stayed present, didn’t start celebrating and were aware that they would probably play better at some point. When that happened we were not taken aback and not upset because that’s how matches tend to go. We didn’t get upset when we stopped playing perfect tennis because we had no delusions that we are perfect. 3. )Be process oriented, not results oriented. You have to learn to enjoy the battle, the ups and downs and the fact that you don’t know how things are going to come out in order to be a great player and in order to get the most out of playing matches. Just like no one ever became a great sailor by sailing only on calm waters, no one becomes a great player be playing nothing but easy matches. Players who focus on results, especially before the match is over or even before it starts do not fare well in tough matches. When you play a match in the ideal mental state, you’re not trying to win and you’re not trying not to lose. You’re just playing each point in a relaxed, accepting state. You are able to go for your shots and play your best because you are in the moment and not getting in your own way. Once you’ve achieved this state a few times it becomes easier to get there more often and stay there longer. It will always be a challenge to play relaxed, judgment free tennis, but it’s worth the effort to work on getting there. 4.) Be a great partner and help your partner when they’re struggling. In my career as a teaching pro and a player I have witnessed countless times where players have turned away from, or against, their partner. For the most part it is done out of insecurity ( people will think I’m a bad player if we lose). Players can miss amazing opportunities to connect with another person, help someone to play better and create a partnership that will stand the test of time. I have a few players I call Superstars! Athletic, competitive, smart, unafraid, supportive. Everything a coach could want in a player in any sport. This summer I gave them some instruction on things to say to your partner during the match. I told them all your statements should come in one of two forms; I need you, or I support you. That’s it in a nutshell. I recently received an email from one of these players. Understand that this person was a successful high school and college athlete in another sport who took up tennis as an adult. She has climbed the ladder to 4.0 in a few short years and will probably be a 4.5 before long. Here’s part of what the email said. That’s amazing! I can’t think of anyone who wouldn’t want this person as a partner. Her intentions are so pure and there is no ego involved at all. She plays great, improves all the time, and everyone wants her for a partner. And more than anything it’s because of her attitude. She’s present and accepting of whatever happens. You know she won’t sell you out when the chips are down so you can relax and play your best. You don’t just make yourself a better player when you have the right mindset, you make others better too!